The Rainforest Cafe ® is at the entrance to Disney s Animal Kingdom ® Theme Park. There are two Rainforest Cafes. One is just outside the gate at The Animal Kingdom, and the other is in Downtown Disney. There is 1 Quarter Machine and 3 Penny Machines at each location. 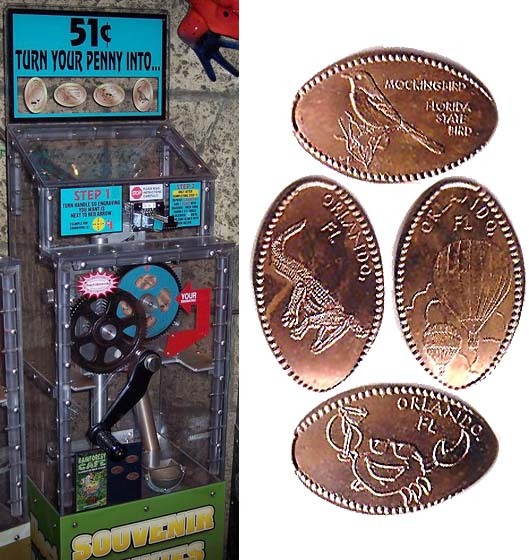 One Penny Machine has different Orlando, FL Designs, and the other two have Rainforest Cafe Designs. The Quarter Machines also offer different Rainforest Cafe Designs at each location. 7/02/12: Machine 6 has 2 new Designs in it. The one with Iggy the Iguana leaning on a Turtle has a much larger Design now, and larger text, and the one of Cha Cha the Tree Frog Jumping replaces an old design of Cha Cha in a Primeval Whirl Car.